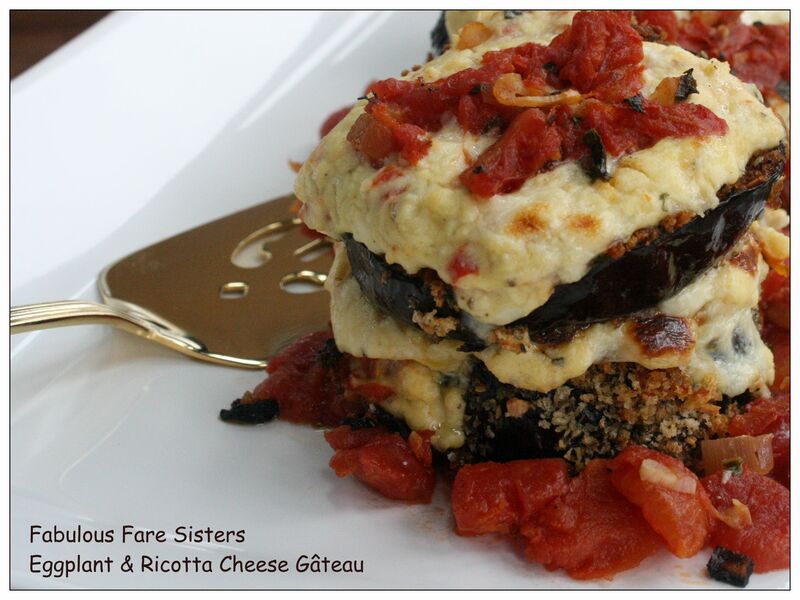 This dish is like a deconstructed eggplant lasagna or kind of like a layered Gâteau. Truly delicious and great for a Meatless Monday meal. Layered flavors make this not only pleasing to eat, but pleasing to the eye. My Hubby said it was the best eggplant he’s ever had. That always makes me smile! Preheat the oven to 350 degrees and in a small bowl soak the sun-dried tomatoes in the white wine. Mix the Ricotta cheese with 1/2 cup Pecorino Romano and the Muenster. Add the garlic salt, pepper, egg yoke, 1/4 cup of the oregano and the sun-dried tomatoes (chopped and reserve the wine for the sauce). Combine with a spoon and set aside. In a skillet, add 1 Tbs of the olive oil and sauté the onions and garlic until tender. Next add the drained tomatoes and 2 tsp Italian seasoning then cook for about 10 minutes. Add the reserved white wine and cook an additional 5 minutes. Last add the remaining 1/4 cup oregano. Cover and place on lowest heat. Slice the eggplant to desired thickness. Using three separate bowls; in the first bowl place the flour lightly seasoned with salt & pepper. In the second bowl, beat the egg with 1 Tbs water. And in the third bowl, mix the bread crumbs with the remaining Pecorino Romano cheese and 1 tsp Italian seasoning. Dredge each piece first in the flour, then in the egg mixture and then the bread cheese crumb mixture. Heat the cast iron skillet on the stove and in the remaining olive oil brown each piece of eggplant on each side. Place in the heated oven and cook an additional 20 minutes. Remove from the oven and evenly distribute the cheese mixture over all the eggplant pieces. Return to the oven and cook an additional 10 minutes. Put the oven on broil and brown for the 2-3 minutes more. On a serving plate place the tomato mixture; reserving enough to place about 1 Tablespoon on the top of each slice. Layer them one on top of another in a row over the tomato mixture and serve. Delicious!!! Thanks… Just making it new if I can. This is such a wonderful dish! I love eggplant! This looks so delicious Heidi! Great idea!!! would love to try this out!! Than you will love this! Wow, that is one beautiful dish and it sounds delicious! Thanks Julie… Eggplant is not a fancy ingredient, but with the right finesse, it can be quite delicious. This dish looks like a beautiful dream come true! 🙂 Pinning this right away! Delicious! Thanks Anna! I’m looking forward to making them again. These look delicious! I make little eggplant pizzas but I don’t usually bread them first. This is such a cool idea! I hope you get the chance to make them soon. They were really good.